Friends don’t let friends miss an opportunity for creative genius, and we have friends to thank for this month’s innovative brew. 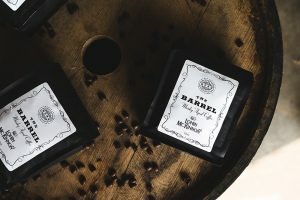 The folks at Central City Brewers + Distillers – who have been brewing some of our favourite local beers out of downtown Surrey since 2003 – ran into a small hiccup in their operations when one of their oak whisky barrels sprung a leak. Unfortunately for Central City, the barrel wasn’t salvageable for its original whisky-aging purpose. Their brewmaster, however, saw no reason for this barrel to stop making great beverages before its time. 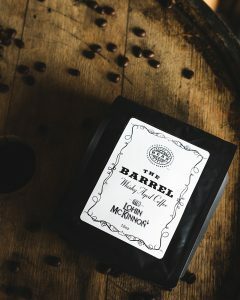 In early June, Central City asked one of our roasters whether we’d like to adopt the barrel to age some of our green coffee beans and infuse them with that distinctive Lohin McKinnon Whisky flavour. And adopt the barrel we did. After being imported to Surrey, B.C. from Tennessee, it had gone through a long journey and we were honoured to give it a forever home in our North Van roastery. But, what to roast? We figured that for a collaboration, it made sense to stick to the theme of “friends”, so the Arabica beans sourced by our buddies in Santa Clara, Guatemala were an easy choice. The Santa Clara is known for being both smoky and spicy on the nose, and we suspected this would emphasize the roast’s Canadian Whisky flavour. Specifically, Central City’s Lohin McKinnon Single Malt Whisky (the barrel’s original occupant) boasts notes of oak, vanilla, and a touch of green apple skins with a buttery flavour on the palate and a dry finish. 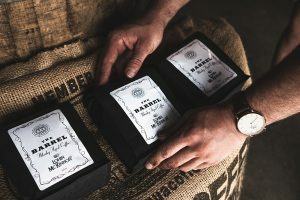 Taking a bean to its full flavour potential is usually equal parts art and science, but we’re not ashamed to say that we leaned a little heavier on the artistic side for this small batch, and we couldn’t wait to see which of the Lohin McKinnon taste elements would stick during the ageing process. So, in went our Santa Clara beans for two weeks of ageing at room temperature, followed by our usual all-senses-on-board precision roasting. Our team’s first sample of the roast came with all the cheeky feelings of having whisky before noon (with none of the “hair of the dog” guilt). For those who want to satisfy their curiosity firsthand, no spoilers allowed, you can pick up a 12 oz. bag for a limited time, only at our West Vancouver location on Marine Drive, Central City’s Brewery and Distillery in Surrey and right here on our website. Those of you who want a heads up on the tasting notes beforehand can read on. The (happy) spoiler: We ended up with a delicious balance of the Lohin McKinnon flavours and our classic Santa Clara. The whisky’s vanilla notes shine bright, and the discerning among us will pick up on a subtle, liqueur-like – almost chocolatey – flavour. We’re not sure whether we have the Lohin McKinnon or the Santa Clara to thank for the smokiness of this roast, but if you’re up for a little Kentucky-style nostalgia, we highly recommend giving it a try. Get yours here! While quantities last.